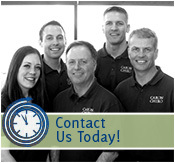 At Caron Chiropractic, P.A., you are treated as more than just another patient. We are dedicated to helping you to live a life in optimal health and completely free of pain. We offer you a total of over 30 years of experience in the field of chiropractic and we constantly keep abreast of all the most recent advances in technology and treatment. We respect you and your time. As a St. Paul Chiropractor, we will do everything in our power to ensure that you are seen on time and that your visit lasts only as long as necessary to provide you with the complete care you need. At our St. Paul MN Chiropractor offices, we utilize only the best and most effective chiropractic techniques available in order to get you back to health. Recent advancements in chiropractic care have greatly improved the speed and effectiveness of chiropractic treatments. At our St. Paul and North Oaks MN Chiropractor offices, we utilize chiropractic procedures to restructure your spine to its most optimum and stable position. When you visit either of our Minnesota Chiropractor offices, our first goal is to relieve pain and symptoms. But our ultimate goal is to restore health. We gladly accept most health insurance. For those patients who choose to pay for their own care, we offer very affordable rates and flexible payment plans allowing access to high-quality care for you and your family. We also provide discounts for same-day payment, students and children. We are providers for: Medica, Health Partners, Blue Cross and Blue Shield, Medicare, Preferred One, Select Care, VA and others. If you do not see your plan listed, please contact our office as we may be participating providers through a differently named PPO.